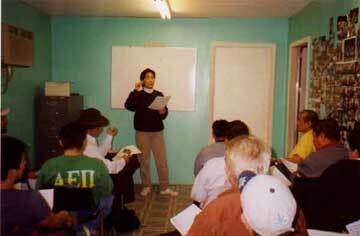 Casa de Maryland gives English classes to people who go to their center looking for jobs. The U.S. is seen as the country to make your dreams become reality. But for many immigrants this task is hard to accomplish. Sad but true this country is where they have to try to accomplish the "American Dream," and they find themselves waiting each day at the 7 Eleven convenience store and other locations to find a decent job to help them and their families get by. Many of them have had problems crossing the border, believing this country would get them ahead and also that this country would provide the best of everything. But they did not know the consequences of their journey. Many of them were professionals back in their countries. They came here to better themselves and their families but they become another one of the jobless individuals waiting at 7 Eleven to receive any kind of job that will pay. This is the case of Carlos, a 30-year-old man, who came from Guatemala. In Guatemala he was an accountant with a degree in economics, working in the main phone company in Guatemala. He decided to come here to work hard and send money his wife and four children hoping that some day he would make enough money to have them here with him, and to see his children become what he could not achieve there. "I came to this country a year ago. It is very hard for me to find a job. Well you will see me here waiting with some friends hoping that someone will show up and give me some work so I can make some money to send to my family back in Guatemala," he said. Santiago is a worker who came from El Salvador. He has been in the United States for two years. Santiago came to the U. S. to see if he could have another kind of life but there are many obstacles to pass through. "I was a merchant in my country and I came here to see if I could have a better future for me and my family. I have four kids, two of them are in this country. They are in the university. My wife is still there with my other two daughters. But I do not worry about them, because now they have their own lives. I worry about me because I came to this country without papers, and that is just one of my problems because without papers I cannot have a better and permanent job which I really want to have," he said. But being without papers in this country is not the only problem. Another problem that many people who first came to this country have to confront is the language. Marcos is a Salvadorian who has been in the country for three years. "The thing that stops me from growing in this country is that I do not know how to speak English, so I am looking for someone who can help me, someone who already knows the place and English so in that way I can learn and some day when I have a permanent job I can organize my life with my family. Also I hope to some day have my own business," he said. Marcos and many others have found a place where they can get a lot of help. The place is named Casa de Maryland. "They help me with my English and also they provided an ID which I can use in some places," he said." They also help me to find jobs, something that is still hard to get because here are too many people who want jobs and not too many people who offer jobs. So you see me here. I haven't had a job for the last five months," he added. Casa de Maryland is an organization where many people, mostly immigrants, but others, too, go to get some help. Alexander Salvador is the coordinator of jobs in Casa de Maryland. "We have about 180 people who need help. Here there are about 15 countries represented," he said. "We have Salvadorians, Mexicans, Guatemalans, African Americans, and many others." Casa de Maryland does more than help with jobs. "Every week we provide some basic products to our people like beans rice and other things," he said. Casa de Maryland is not a governmental organization but they get some help from organizations and individuals. Casa de Maryland also focuses on health programs like HIV and colon cancer. They also have lawyers who help with legal issues and they give English classes. So even though life is not easy for the people who have come to the U.S. trying to improve their lives, many feel lucky that Casa de Maryland offers help and resources to make life a little better.